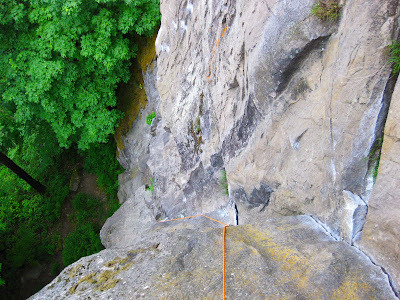 I went to Broughton Bluff for an afternoon of trad climbing with quite the character from Troutdale. 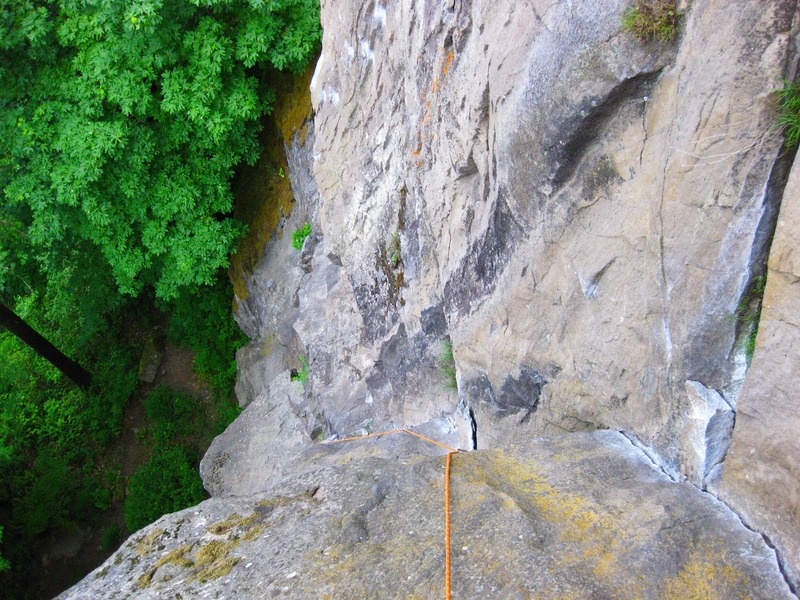 Dennis, as he introduced himself, is one of the original climbers from the area, who along with John Opdyke established the majority of the first route on Beacon Rock, the preeminent climbing destination of the area in the 1980s. We met in the parking lot and hiked up to the base of Gandalf's Grip, a three pitch crag classic. The line follows the center and highest portion of the north face of the bluff, overlooking the Columbia River and downtown Troutdale. The scenic view overlooking the Sandy River. New construction on I-84 is in the foreground, then Troutdale airport, the Columbia River, and Prune Hill (WA) in the distance. The main street on the left of the photo is the main street of downtown Troutdale. Lewix and Clark are purported to have stayed at the location of the park at the bottom, center of the photo. The base of the route starts with an aesthetic 5.8 hand crack, easily protected with nuts and cams. 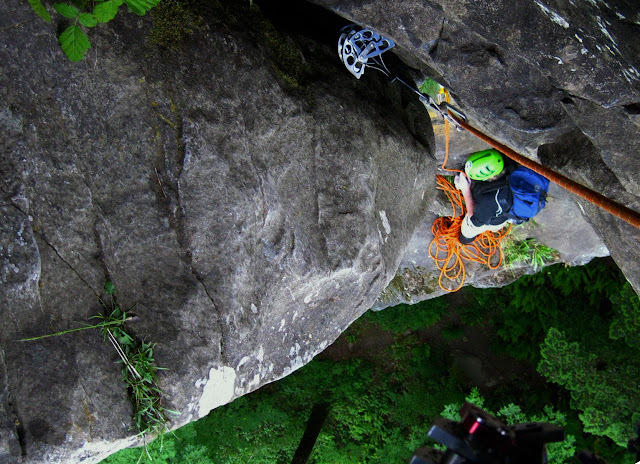 As the crack trends left, you encounter more difficult face climbing and a few bolts. The final overhang pull almost comes as a surprise, the "pitch" is so short. Since I saw no reason to not continue climbing, I ventured on up a picturesque, steep 5.8 dihedral, finally ending at the bolts at the top of pitch two (30m total). The final fifteen feet to the top of the cliff were very peasant with bomber hand jams and fist jams. Though technically considered and OW, it was easy and protected with a #2 and #4. Great views from the top. A single rack from #0.3 to #3 and a set of nuts was sufficient for the first two pitches. The view from halfway up the last pitch, above the OW. After walking off and retrieving the gear we had stowed at the base, we walked around on I tried From Something to Nothing a thin , steep, but short 5.10d which, on the final bulge, required a finger pocket pull up. Unable to do it, I abandoned a biner on the 5th bolt. The climbing here was classic basalt columns. Definitely worth an afternoon. The bluff is private property, trespassers will be shot!